A Publishers Weekly Best Book of 1993 Editors’ Choice, 1993 New York Times notable book, an American Library Association Best Book for Young Adults, and the Council of Wisconsin Writers Best Novel of 1993. But Shizuko Okuda did commit suicide, and Yuki had to learn how to live with a father who didn’t seem to love her and a stepmother who treated her badly. Most important, she had to learn how to live with herself: a twelve-year-old Japanese girl growing up alone, trying to make sense of a tragedy that made no sense at all . . .
A jewel of a book, one of those rarities that shine only a few times in a generation. . . A work of art. Lyrical. . . A beautifully written book about a bitterly painful coming of age. Quietly moving. . . An emotionally and culturally rich tale tracing the evolution of despair into hope. 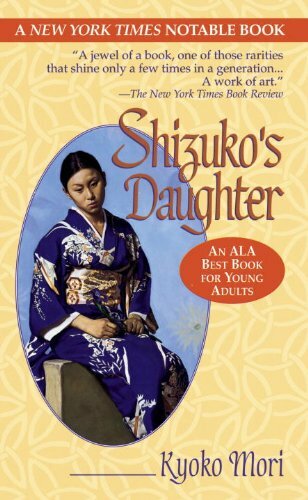 This entry was posted in Books, Shizuko’s Daughter, Young Adult Novels on September 20, 1994 by Kyoko.